Cotton-spinning in all its stages may be seen at the great factory at Causeway Bay, owned by the Hongkong Cotton-spinning, Weaving and Dyeing Company, Ltd., the general managers of which are Messrs. Jardine, Matheson & Co., Ltd. The buildings are nine in number and cover a very large area. The total space enclosed is 400,000 square feet, and the Company has sufficient ground to double the present plant should occasion arise. The size of the mills may be judged by the fact that there are over 55,500 spindles. The raw cotton comes principally from India, while China is the chief market for the manufactured article. The bales of cotton are broken open and their contents fed into the bale-breakers which remove seed and other impurities from the cotton in readiness for the hopper feeding machines in which a straightening-out process takes place. In the scutching department the cotton is freed from dirt, leaves and other impurities by means of powerful fans, and as it issues from the scotching machines it is wound into what is known as laps. Four of these laps are placed on a second machine and made into one with the object of ensuring uniformity of thickness. On the carding engine the cotton is combed out by large cylinders, covered with slightly projecting wire, and working to the thousandth part of an inch, while in the drawing frames the carded cotton is drawn out and the fibres are placed in a perfect parallel order. In the slubbing, intermediate and roving frames the cotton is twisted, each process making the thread finer and at the same time stronger. The spinning and reeling frames complete the process, and the yarn is then wound into hanks and then put into bundles, which are stamped with the firm’s chop – the dragon and flag labels being the best known – and baled ready for export. In 1914, the factory had to relocate to Shanghai because of a lack of skilled workers, shortage of electricity and “clear water”, and because of Hong Kong’s humid weather which caused problems with spinning yarn. A notice on 20th May 1914 in the Government Gazette states that the company was entering liquidation. 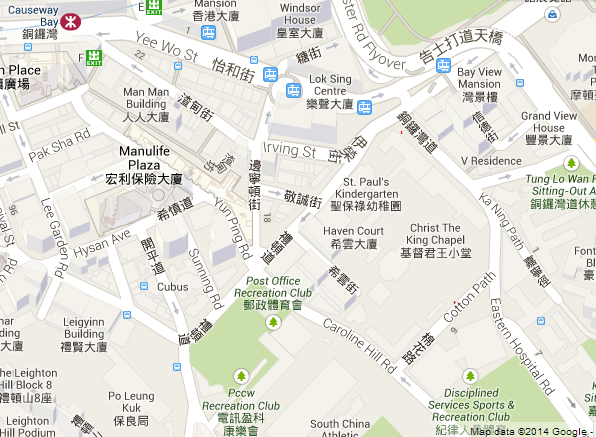 As far as I can make out the cotton mills were located where the present day St Paul’s Convent School and St Paul’s Hospital are in Causeway Bay in an area bounded by Leighton Road, Caroline Hill Road, Eastern Hospital Road, and interestingly enough Cotton Path. The site was sold to the Sisters of St.Paul of Chartres, which founded the convent and school. This article was first posted on 14th June 2015. Thanks to IDJ for the information and images he provided. About Nanyang Cotton Mill Ltd. According to an article written by David M. Swan, Jardine Matheson concerns in China developed a particular kind of control method named “managing agency system”. Industrial companies were not subsidiaries of the main company but had its own shareholder structure and charter of association. They kept this system in the diverse sectors such as silk, sugar, brewing, egg processing, press packing, and other sectors. Does anybody know about it? I’ve also heard that in Jardine’s industrial concerns there was a mix of British and Chinese shareholders… In Shanghai the Jardines opened a big mill in 1896 called Ewo Cotton Spinning and Weaving Company. It started production in 1897 with almost 30,000 spindles, reaching 50,000 spindles in 1899. According to Swan, they ordered the spindles to Platt Brothers (see the post of Hugh Farmer on Platt Brothers on January 13). 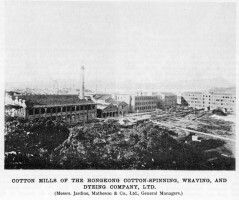 David M. Swan (2001): ‘British Cotton Mills in Pre-Second World War China’. In Textile History, 32 (2): 175-216. Carles, I had never heard of the “managing agency system”. 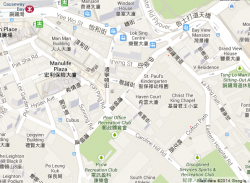 I have posted a new article with that name to see if there is a Hong Kong connection. The Cotton Spinning Factory at East Point was opened in 1899 and was operated until late in 1910 or early in 1911 when it was closed down. As a business proposition it was a failure, the lack of skilled labour proving the greatest obstacle to its successful operation. The building was subsequently purchased by the French Sisters and the French Sisters Hospital now stands on the site of the old mill. The machinery was sold to Ewes and shipped to Shanghai in 1913.